The other day I had a lovely conversation with a lady about Nigerian literature. We spoke about different novels, the state of literature today, and she even recommended some Nigerian authors to me. During our conversation she asked me if I had heard about the Pacesetters Series, and informed me that it was probably before my time. So obviously, once I got home I had to find out about this Pacesetters series. The Pacesetters Series were a collection of 130 novels written by African authors (mostly Nigerian, but there were also Ghanian, Kenyan and South African writers) for an African audience. It was 1977 when Macmillan decided to publish this low-cost paperback series - with publication mainly happening between 1979 and 1988. They were very popular in the 1980s until the series disappeared in the 1990s as a result of structural adjustment programmes. I previously mentioned how structural adjustment programmes affected many industries in Nigeria, including the publishing industry, and I guess the Pacesetter series were one of those to be affected. I love the covers. I know they're a bit garish, and so 1980s with their African pop art, but there's just something about them and how the colourful images portray what the novel is probably about. They are a testament to their time. * Images sourced from Pacesetternovels. It turns out the Pacesetters novels are actually still available - there's a website, Pacesetternovels, that sells them and it has about 100 of the books. I wonder if anyone out there who grew up with them, still has copies - as they're probably collector's items. Whether you grew up reading it and are feeling nostalgic, or are like me, who was't fortunate enough to grow up with (or read) them, the website is worth checking out. And a big thanks to the lovely lady for telling me about the Pacesetters series. So much fun to discover a series you find interesting and didn't know about previously. Hope you can read a couple. Wonder how dated they are now. I know right!!! I hope so too. Although at £5 a book on the website I found, I might have to go hunting for them here. I'm sure someone out there must have some vintage copies stashed safely. I've heard about this series a number of times but haven't read any of them. Nice to see you featuring them! I absolutely loved Pacesetters. I was so young when I started reading them, and my brother had to hide some of them from me saying I was too 'young' for them. Most of them were borrowed though. I think there's only one left lying around the house somewhere. I still haven't had a chance to read any of them. If you find the one lying around the house, would be cool. I feel like something like that would be really cool to save/have around. I read a few while i was young, the best being 'The Smugglers'. The book was a hit. You really should read some of them when you can. Wow, this is amazing! I grew up reading these in senior primary school. A must read series for all. You're guaranteed to get hooked on these. I remember how i could not put them down and was only 10/11 years old at the time. Thank you to all the writers who kept us entertained and the publishers who made it all possible. That was a great read! pls whr did you get it? Where can I find these books. I am in dire need of them. My mother used to own a couple, I remember Wages of sin (Ojiji) and the cyclist very well. I would like to buy and re-present to my mother. I am sure she would love to have them again. OMG they were my favorite African lit. series when i was younger, my mum used to own them but i doubt that she does anymore. they're always worth the read. MEANWHILE I'M INSPIRED BY YOUR LOVE FOR AFRICAN LIT. Seeing this covers makes me all dreamy. Although i don't remember the content i know EVBU MY LOVE used to be my fav. Can i get those books in Nigeria or do you have a site from which i can read online? 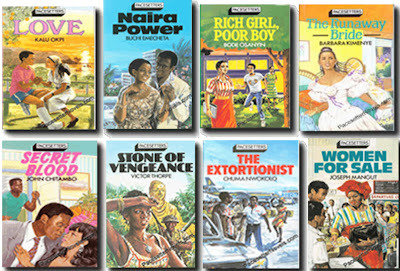 i really miss those days, wen my mum wld flog me for not doing chores bt choosing 2 read pacesetters. They were so addictive nd caught all of my attention.. i almost read dem all.. Evbu my lover, death is a woman, An angel of death, The hopeful lovers, the smugglers, A kind of marriage nd so much more..wish i cld get it nd present them 2 my kids, i discovered them thru my mum.. I grew up reading pacesetters. I remember Ebvu my love and Undesirable Element. Just sitting here in Johannesburg after midnight, reading through all these wonderful words and thoughts from you all about the Pacesetters. I wrote two of the list, but it never occurred to me that they were this popular throughout Africa. Interestingly, early this week a young Zimbabwean attorney was pleading with me to go back into publishing. With this kind of comments from you all, I am beginning to give his advice serious thought. Thanks a lot all of you. Peter J Katuliiba. I loved your books Mr. Katuliiba! Thankyou. Any new titles out? 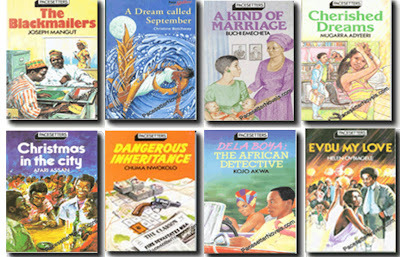 these books were part of the background of growing up in rural nigeria, big ups to all the authors. Grew up reading those books. The noslstagia i feel right now.. God bless the authors and Macmillan. Kids these days should read them too. Great memories! 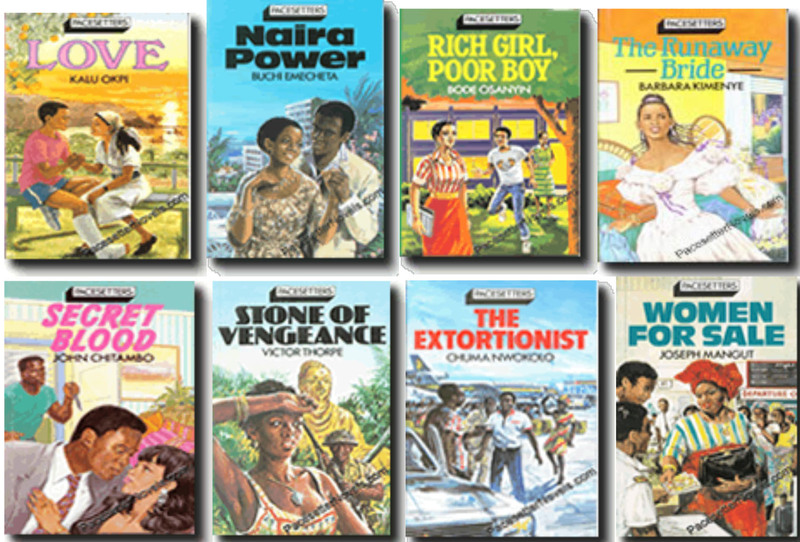 My late mum used to buy me pacesetters series for me from the only bookstore we had on our street in Surulere. Wow! U've got such as bright memory. When I saw 'Evbu my Love and the Undesirable element, I was ecstatic! I was telling a colleague about Pacesetters today and decided to Google Pacesetters and stumbled on this site. I read my first Pacesetter novel in primary school - a friend's older sister gave me 'Evbu My Love' after I told her about reading David Copperfield (abridged version) in primary 4. I actually had 33 Pacesetter novels in my collection back then. Wonderful authors, plots and all! Miss those days. Nostalgia is the word!!! love them! I managed to read up to 10 when i was young, until I couldn't find them any more. Loved "Symphony of Destruction", "The Infamous Act" and "Too Cold for Comfort"
Hi my friend! I wish to say that this post is awesome, great written and include almost all significant informations. I read a lot (and I mean a lot) of them in secondary school! Cant wait to read at least one of them again...Undesirable Element was a classic title! Oh God! During my secondary school days, I could kill for a Pacesetter read! Didn't get the chance to read many, but the few I did read kept me spellbound, and marked my adolescence for ever. I remember "Have Mercy" with Mariom Macham as protagonist, Sam Adewoye's "The Betrayer", "Race against Rats" (with Inspector Zack Biko as protagonist),and there's one in which some rich old guy gets a young girl pregnant and almost gets her locked up, but for the timely intervention of some young handsome lawyer (forgotten the title of that one). But I think the one which really touched me and still makes me teary to this day is "Child of War" by Ben Chirasha! Impeccably dramatic story! My very first Pacesetters was Evbu my love,then there was Blood path at lobster close,for Mbatha and Rebecca,Rat race,Christmas in the city,The black temple,rat race.......I will give any thing to have a copy.I read my first copy at the age of 10. Anyone with useful information's on how to get pacesetters series? I work with an organization who wants to give out this books to schools. Please write me if you can help -readersresortinitiative@gmail.com. Wow! Wow! Wow!!! This selection took me down the memory lane. One of the very first novels I ever read was Evbu My Love! Thanks for bringing back wonderful memories of my childhood and teenage years. Evbu My Love,Sisi,The Undesirable Element and Christmas in the City(which I lost in primary school after lending it out). I feel so nostalgic remembering these books. They were so beautiful. I think we still have Evbu My Love and Sisi somewhere in our house. I really miss reading. Been overshadowed by work.